I really wanted our wedding to be memorable for our guests. I love personal touches and fun details. Here are some of the unique things we did! I know this is not completely original (I got the idea from Pinterest, of course), but it was meaningful and less common than a unity candle or sand. We made this ourselves, so it was cheap. It has 3 strands of rope, representing husband, wife, and God. 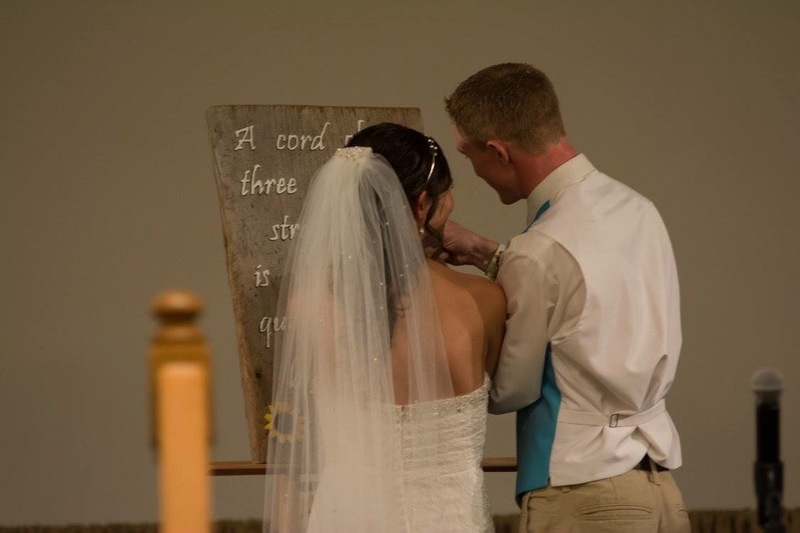 During the ceremony, we braided the strands together. 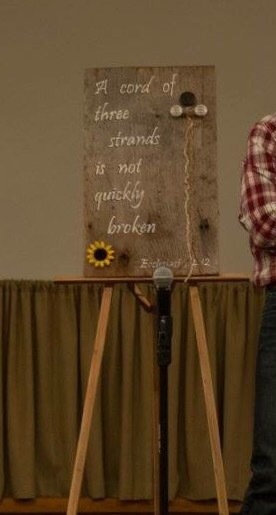 It says “a cord of three strands is not quickly broken. Ecclesiastes 4:12” It’s hanging in our house now! I’ve heard about lots of different ideas like this for ceremonies, so do some pinteresting and be creative! We wrote our own vows. We got more compliments on our vows than anything else! 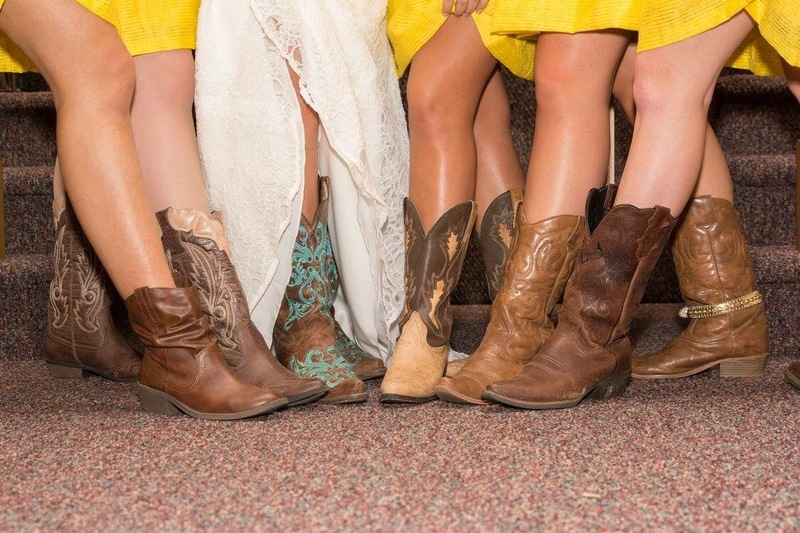 Our whole wedding party wore cowboy boots. My boots are my babies! I had to wear them! This is becoming pretty popular now, but you can make whatever statement you want with wedding shoes! 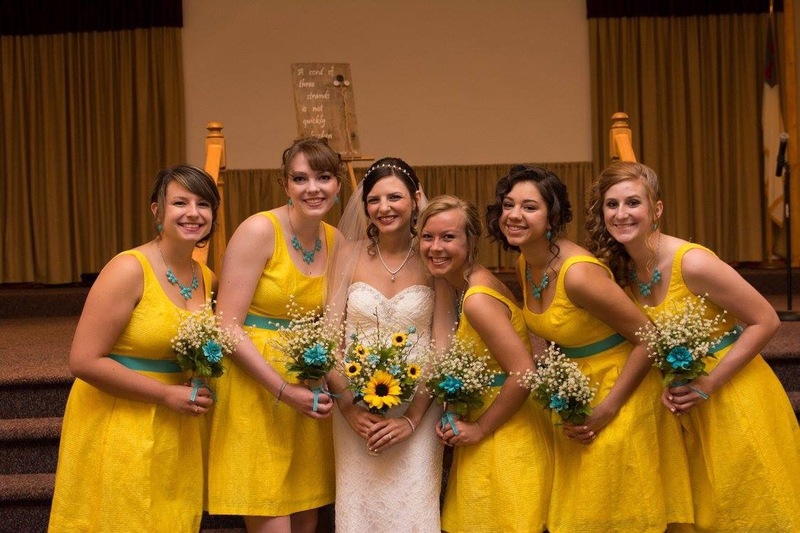 I did not make my girls buy expensive bridesmaid dresses. These are from Bon Ton. I can’t remember the exact price, but they were under $50! I took the belts off and we tied turquoise ribbons around instead. 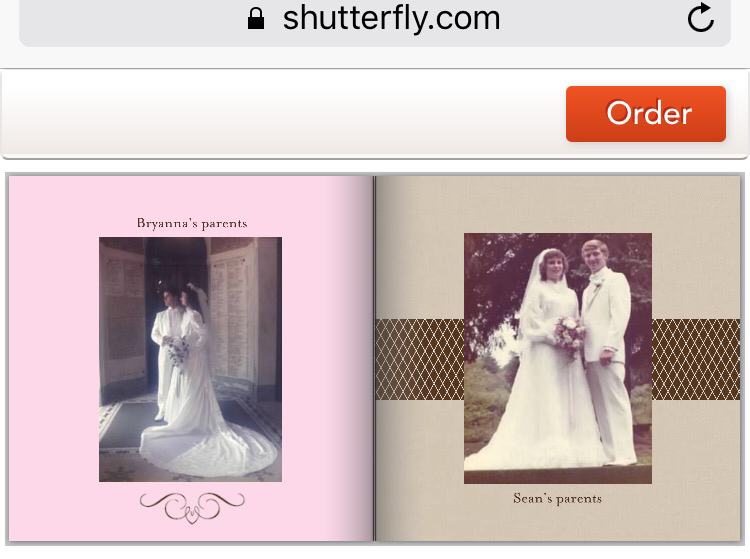 Our guestbook was a Shutterfly book that I made. I got wedding pictures from all of our family member’s weddings and filled the book with them. Guests signed throughout the book! If you can get a code for a free book, you only pay $8 for shipping! The possibilities are endless with a guestbook that you create yourself! Our place settings included a card for our guests to fill out. It asked for wedding advice and asked some fun and silly questions too. I loved looking through the responses! We played The Newlywed Game at the reception. 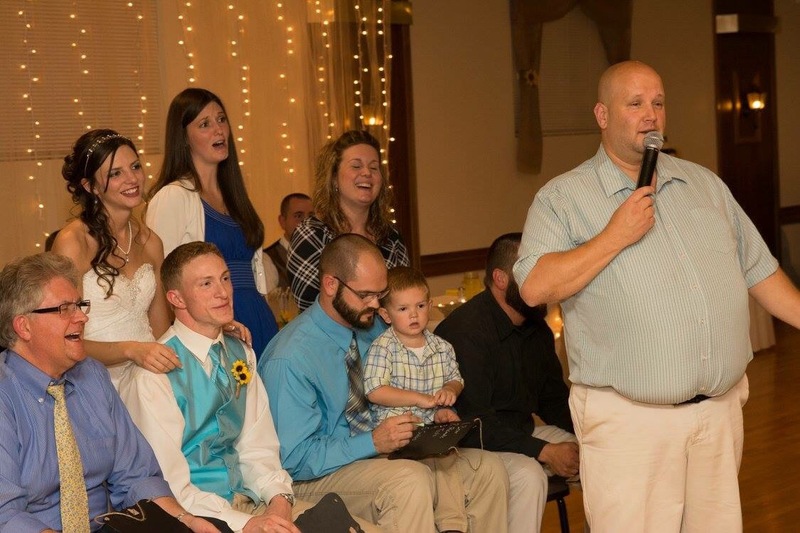 This was disappointing at our wedding, but the questions chosen were not very funny and the game lasted much too long. We asked some of our family members to play with us! It was fun and would be a good idea if planned out a little differently. 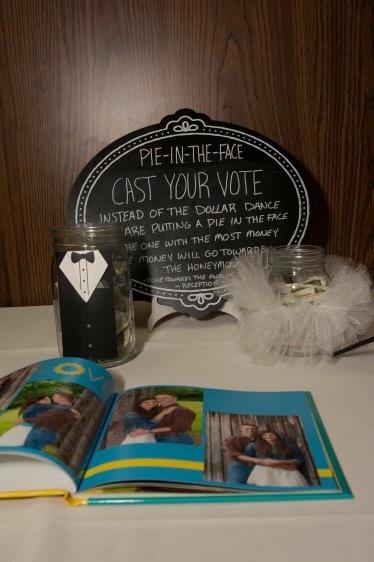 I hate the dollar dance, so we raised money for our honeymoon by having guests vote on whether my husband or I would get a pie in the face at the end of the night. Mr. Rockefeller was a good sport. 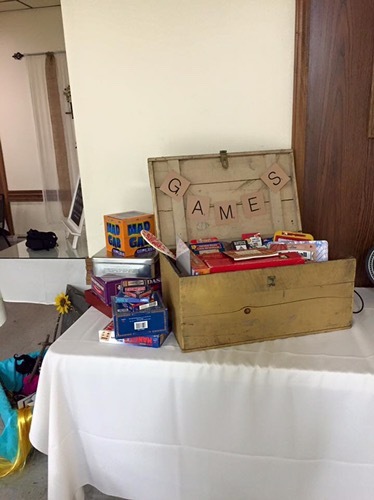 We had a crate of games and toys to keep our little guests and guests who don’t like to dance entertained. Don’t be afraid to add personal touches to your wedding and make it fun for you and your guests! 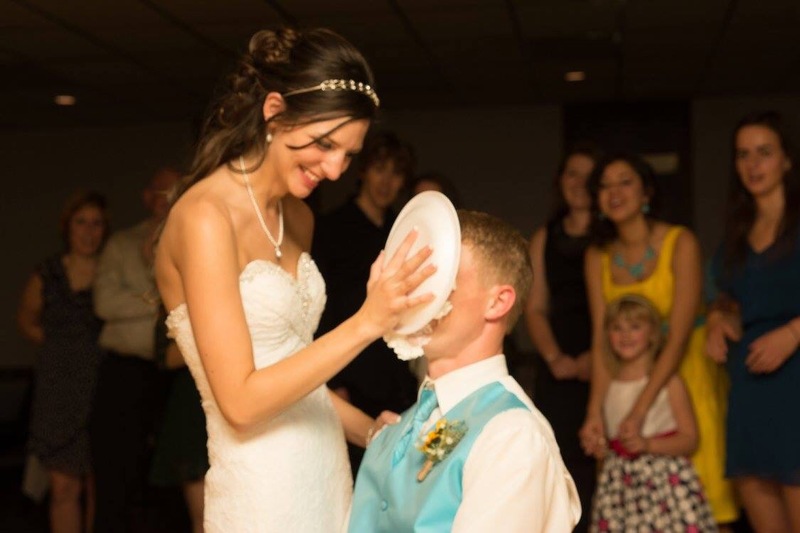 What fun things did you do to make your wedding more special?